From 11w take Netherland Inn road to Netherland Inn. Park across the street and walk the Greenbelt towards the bridge along the Holston river. 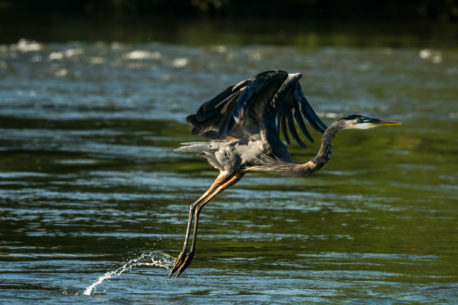 A Great Blue Heron lifts its self out of the Holston River as it starts to fly away. I had spent about an hour with this heron before this image. After he was done fishing and pruning himself, he took off to the tree tops. The shot was taken as left for those trees.